Start working with professional equipment on day one in small classes that allow an individualized education. Produce twelve short film projects to solidify your skills and create a capstone grad film that will make your reel stand out. Gain in-depth knowledge of film production and build a strong portfolio that showcases your work as a creative film professional. Your career in film is awaiting you. InFocus alumni have won awards, received grants and made the selection of prestigious festivals right out of school. You could be next. As a visual storyteller, you need to understand the technical and logistical tools at your disposal while at the same time exploring your artistic voice. We encourage experimentation and artistic risk to ensure you maintain creative autonomy while building your skills. We are here to guide you in reaching your potential as a filmmaker. 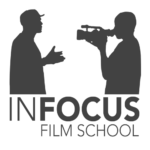 Located in a heritage building in downtown Vancouver’s culturally vibrant Gastown neighborhood, InFocus Film School is at the heart of the city’s film industry. Film is one of the largest industries in Vancouver and we maintain an excellent success rate placing alumni in jobs. In just 12 months, you could be working on one of the sets often seen outside our windows. Find out how to join Vancouver’s film industry!